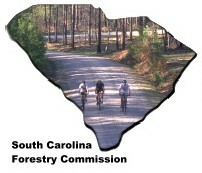 To find Harbison Environmental Education Forest, take I-26 to Exit 103 (Harbison Blvd.). Turn left at the light and proceed to Broad River Road. Turn right, go through one traffic light, then turn left at the Harbison State Forest road sign. Parking for hiking or biking is available in the parking lot on the left. To reach the Environmental Education Center, continue past the parking lot and bear left through the gate onto the gravel road. Take the first right onto another gravel road. The Education Center is at the top of the hill on the left. If your destination is the Gazebo, go through the gate, past the Education Center road, then take the first left. Take the first right - the gazebo, picnic area, and restrooms are on your right. To reach the Eagle Shelter, go through the gate, pass the Education Center road, take the first left, stay straight past the Gazebo road. The road will dead-end at a parking lot. If you park there you can walk to the Eagle Shelter by following the trail signs.